Glenn Beck Headquarters—Deep in the heart of an undisclosed Denny’s, Glenn Beck and the rest of the League of Extra Ordinary Gentlemen assembled in a last ditch effort to save the Republican party. The Discord’s own field reporter, Cokie McGrath, was able to gain entrance to this clandestine group before the breakfast specials ended. Glenn Beck called for order by banging a ketchup bottle on the end of the table before addressing a small booth filled with Governor Rick Perry, the late Mathew Breitbart, and either ZZ-Top or three of the members of Duck Dynasty. Some had pitchforks others held lit torches. The waitress was pissed. This secret Ted-Cruz-admiration-society vowed to do everything in its power to keep the current GOP frontrunner from becoming the nominee. Shouts of “kill the monster!” abounded. Many questions remain. 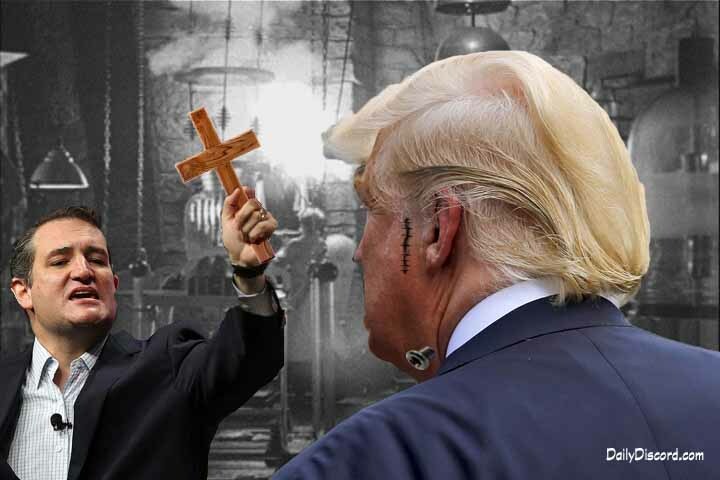 In the above picture, why is Ted Cruz attacking Frankentrump with a cross? Is this Photoshopped image proof that your choice for president is unfamiliar with the horror genre? What next, firing silver bullets on ghosts, head shots for vampires, holy water on Sharknados? Perhaps more importantly, can these be worked in to existing Denny specials? Although this post has been around for the better part of two years, I just noticed it this morning after being awake since four am. What that has to do with anything political is immaterial, except that I probably wouldn’t have come across this website if I hadn’t been online for several hours to pass the time. And I’m glad that was the case, because suddenly I feel much better! The illustration was hilarious, and the headline was brilliant. 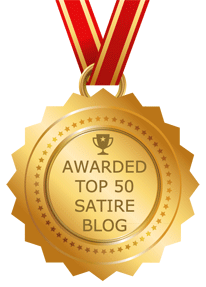 However, some people might question Mr. Zano’s credentials as a satirist, given that his description of the gentlemen thus portrayed is actually not such an exaggeration after all. It’s more like reporting the news. I loved it! Keep up the good work. Thanks, Richard! Everyone has always questioned my credentials, and rightly so.